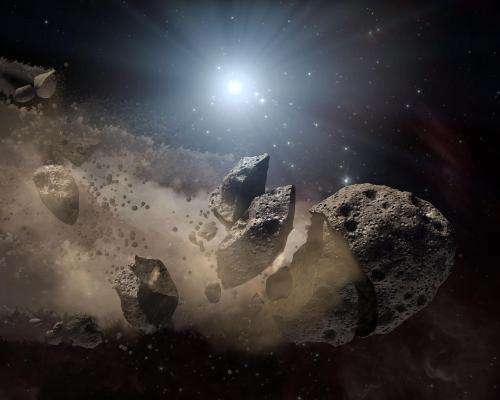 Fewer large near-Earth asteroids (NEAs) remain to be discovered than astronomers thought, according to a new analysis by planetary scientist Alan W. Harris of MoreData! in La Canada, California. Harris is presenting his results this week at the 49th annual meeting of the American Astronomical Society's Division for Planetary Sciences in Provo, Utah. Observers have been cataloging potentially hazardous asteroids for decades. Based on the number of finds, the area of sky explored, and the limiting brightness our telescopes and cameras can reach, researchers can estimate what fraction of the NEA population has been detected so far and how many more objects lurk undiscovered. Harris has published numerous such estimates over the years. Recently he realized that his estimates have been plagued by a seemingly innocuous but nonetheless consequential round-off error. Once corrected, the estimated number of large (diameter > 1 kilometer) NEAs remaining to be discovered decreases from more than 100 to less than 40. The population ("size-frequency distribution") of NEAs is usually given in terms of number versus brightness, since most discovery surveys operate in visible (reflected) light. Brightness isn't a reliable proxy for size, though, because asteroid surfaces don't all have the same albedo, or reflectivity. NEA brightnesses are expressed in units of absolute magnitude H, with lower numbers indicating brighter objects. The IAU Minor Planet Center—the world's clearinghouse for asteroid measurements—rounds off reported values of H to the nearest 0.1 magnitude. While this is mostly unimportant, amounting to a reduction in the estimated NEA population N ( <H ) of only about 7%, it becomes significant in assessing the completion of surveys for the largest objects. In a 2015 study, Harris and Italian astronomer Germano D'Abramo estimated that there exist 990 NEAs brighter than H = 17.75, which is considered equivalent on average to a diameter D = 1 km. After correcting for the round-off problem, that estimate decreases to 921 ± 20, consistent with a recent estimate by Pasquale Tricarico (Planetary Science Institute), who used similar data but a different computational approach. We know how many NEAs of H < 17.75 have been discovered: 884 according to the latest tally by the Jet Propulsion Laboratory. The previous population estimate of 990 implied 89% completion and 106 yet to be found. The new estimate of 921 implies 96% completion and only 37 left to be found, almost three times fewer. The recent NEOWISE survey, which more directly measured NEA diameters from their thermal infrared emission, opens up the possibility to transform the population estimate from brightness units, N(less than H), to sizes, N(>D). The transformation method resembles a game of Sudoku, but the rules are different. We can make a table, nine columns wide like Sudoku, with each column representing a range of albedos, for example 0.0703 to 0.1114, and vertically with 25 rows, each row representing a range of diameter, for example from 0.794 to 1.000 km. These bin sizes are chosen so that each range in diameter or albedo corresponds to 0.5 magnitude in brightness H. With this arrangement a diagonal sum across the boxes follows a constant value of H, and this sum should equal the known n(H) for that value of H. Horizontally, the sum of the boxes across represent the desired number n(D), and the best solution in each box needs to follow the albedo distribution defined by NEOWISE. Unfortunately the solution depends rather strongly on the albedo distribution, so if one chooses the distribution for all NEAs, or just "Earth-crossing asteroids" that actually have any probability of impacting, or just big ones, or only small ones, one can get quite different answers. Harris solved the "Sudoku" puzzle for a variety of reasonable albedo distributions and derived estimates of N(D > 1 km) ranging from about 750 to 900. The good news is that this seemingly large uncertainty in the total number does not much affect the completion fraction of 96%. So the number of large (D > 1 km) NEAs yet to be discovered is still limited to around 30 to 40.